The idea for a West Heights United Methodist Church was born when a religious needs survey was taken in the mid-1950’s in the communities of Westlink, Rolling Hills, Country Acres and the surrounding area. This survey showed that it was time to start a new church in this west Wichita suburban area. Preliminary meetings were held in July, 1956 and morning worship services began August 5, 1956 at Peterson School. This was followed in five weeks by church school classes for all ages. On September 9, 1956, the Rev. Gene S. Seeley assumed his duties as the first minister for West Heights Church. Dr. Otto F. Volkland, District Superintendent, conducted the official organizational meetings on November 5, 1956, which included the reception of 18 charter members. This was the first meeting held at 9812 Birch Lane, a residential property which had been purchased as a meeting place with an eye to its future use as a parsonage. On October 20, 1957, the Rev. Irvin A. Unruh became the new minister for the fledgling church. The ground-breaking service for the first unit of the church was observed January 5, 1958, with Dr. Otto F. Volkland officiating. By that month 54 persons had joined the church and became the designated charter members. Dr. Raymond E. Dewey, District Superintendent, presided at the August 17, 1958, ceremony for the laying of the corner stone. The first services were in the South wing on September 7, 1958. The 250 members were pleased with their new sanctuary/fellowship hall, kitchen, and six classrooms. At that time the Birch Lane property became the parsonage. Ground breaking for more educational space took place in the fall of 1960. By that time the membership was over 400, the average attendance was 300, and the church school enrollment was 325. The Rev. Charles M. Curtis was appointed new minister on June 2, 1963. On May 23, 1964, plans for a new sanctuary and additional educational facilities were presented to the congregation. On June 1, 1966, the Rev. George T. Gardner was appointed the new pastor. On August 6, 1967, ground breaking for the new sanctuary took place, with the cornerstone laying ceremony occurring on March 24, 1968. 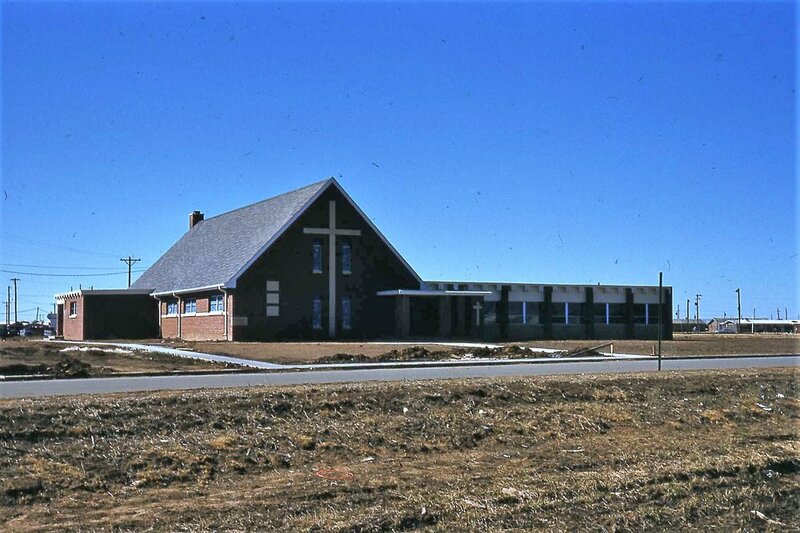 Then on April 10, 1968, the first worship service was held in the new sanctuary. During the following years of church school growth and adjustment, several persons provided pastoral leadership. These included Jim Pohl (1972-75), Wayne Castle (1976-77), Jack Ropp (1977-78), Keith Williamson (1978-79), Cecil Findley (1978-79), and Rev. Sam Muyskens (1979-92). During this time an Associate Pastor, Rev. Wenners Ballard, was added to the staff as well as additional part-time lay staff members to assist with visitation, education, youth ministries. In 1986 Judy Castor was brought on staff as full time Director of Christian Education. By 1986, it was obvious that some extensive repairs were needed on the existing facilities and there were persistent concerns about expansion possibilities. An architect was asked to draw up a tentative set of renovation and expansion plans for future guidance to the congregation. The plans were presented to the congregation and a capital fund drive was initiated to see how much and how fast the congregation wanted to proceed with the improvements. The response to the three-year pledge period (1986-89) was such that only the refurbishing part of the work could be undertaken at that time. The parking lot was completely redesigned and enlarged; insulation and new roofing was applied to the Sanctuary; a new north entrance was added; a new sound system was installed and the Sanctuary lighting was improved. In July, 1994, the architect provided the final expansion plans; by August the construction documents were ready for bids; by September a construction firm was chosen; by November construction had started. By October, 1995, the “connecting link” between the Education building, on the south, and the Sanctuary, on the north, was ready for occupancy. By January, 1996, the total project was finished. So a new spirit of excitement and promise rippled through the congregation. Space to expand existing activities—and to explore exciting new ones—lays before them. Now was a time of renewal for the church family as it reached new challenges beyond its “Life Begins at 40” milestone (1956-1996. The next decade (1996-2006) saw the church with the new facilities grow. The Youth program expanded to sometimes more than 60 on Sunday nights. The preschool expanded in the new area and new programs expanded to fill the new enlarged facility. Changes came to West Heights in the decade following (2006-2016). There was a drop in attendance at both Sunday morning services and in the Youth and Children areas. This seemed to be following attendance trends in the Methodist Church as a whole. A new set of needs were identified by the congregation and it was decided to begin a Capital Campaign to address these needs, beginning in 2012. Retiring the debt, updating the heating and air conditioning, repairing the steeple, lighting and sound in the Sanctuary, finishing the basement with a music center, were among the main needs. We had a successful campaign and many projects were completed. Since 2016 we have become more “neighborhood” oriented and are expanding our outreach. Pickleball was introduced to an enthusiastic bunch to include members and brought in outsiders. Trunk or Treat and Party in the Park brought in many from the neighborhood. This decade has brought a renewed focus on missions. A mission team was formed and many new programs were started. Family Promise, a program to help end homelessness among families, was held in December 2018 for the first time. Though the music center was not able to happen in the Capital Campaign, plans continued and finally in January 2019 construction was begun on the “The Ellan Muyskens Fine Arts Center.” A new service “Café Chapel” started at 10 am on Sunday mornings and has been growing each week. West Heights United Methodist church is an active and vibrant church. There is something for everyone, from Youth and Children’s programs, music programs for all ages, bells, missions, three Sunday morning services, preschool, United Methodist Women, book studies, family bingo and much more.